The hospital is located on Euston Road in the Fitzrovia area of the London Borough of Camden. It was founded in 1834. The ghost of a nurse who appears when morphine is set to be administered haunts the old part of the hospital, not the new area that was opened in 2005. Her tale is a tragic one, for she is said to have accidentally given her fiance an overdose of morphine and this resulted in his death. Pictured left is the old part of the hospital courtesy of N. Chadwick. Fitzrovia is a district in central London, England. It is situated between Bloomsbury and Marylebone, and north of Soho. It is characterised by its mixed-use of residential, business, retail, education and healthcare, with no single activity dominating. 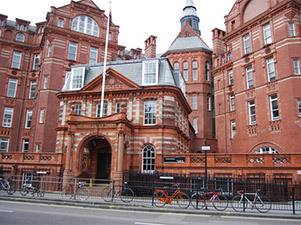 Pictured left is University College Hospital courtesy of Tagishsimon. Licensed under CC BY-SA 3.0 via Wikimedia Commons.